Rossi, I asked before you. And I got the same reply. No,no Mike still not for sale. I can't say I blame you Volker. Thats a beautiful guitar settebello!!! not all st-100 have gold hardware... I have seen a couple with body and neck stamps of st-100, but normal coloured hardware..
Maybe they have changed hardware. Mine have nickel tuners,but the washers,the stringtree,the tremolo and the jackplate are gold. 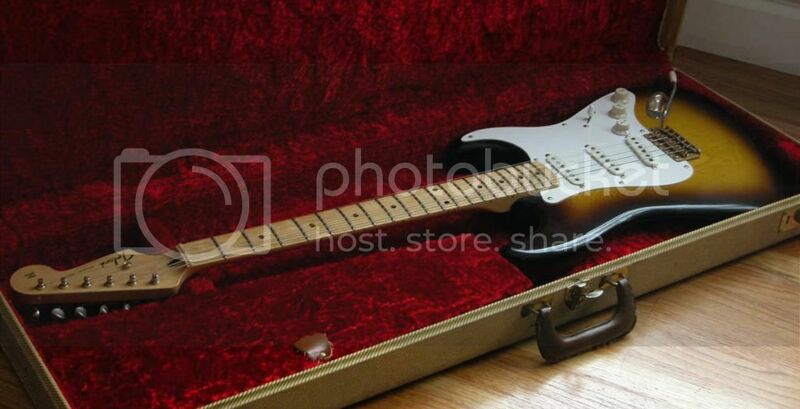 all the hardware was tokai original, so unlikely it was changed, plus there is a catalogue scan of an ST-100 without gold hardware, and another for sale in Japan with nickel all over and the 100 stamp..
Thats the best on tokais,you can never be sure,allways new surprises. Has anyone got an ST 120? I've never seen one and am interested in seeing what they are like and what you think of them. They seem to be rarer than LS200s! Cheers. Here's my ST-120. I bought it used in about 1980. It's a V-neck model with a one-piece body, staggered magnet pickups and gold-plated parts. Interestingly, it has a "soft" 5-position switch (the in-between detents aren't as pronounced.) Three-digit serial number, not counting the zeroes. Sounds like an old Strat, and probably better built than most Fenders. Needless to say, it's not for sale.